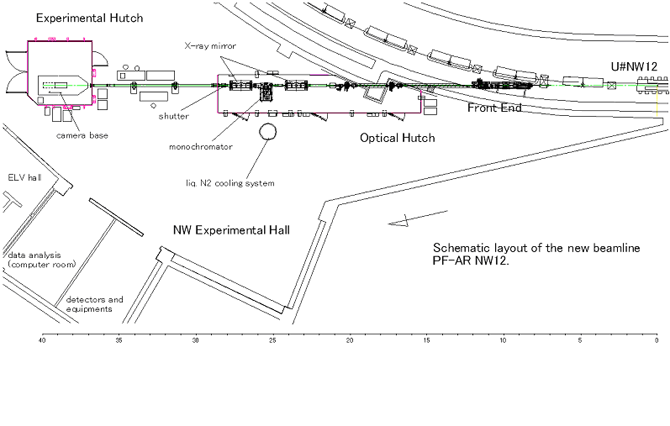 NW12A is deigned for high-throughput MAD experiments with high-flux undulator beam and a rapid data acquisition system. Using double crystal monochromator cooled with liquid nitrogen, a wide energy range of the the monochromatic beam is available with fine energy resolution. Collimating Mirror: 23.5 m Rhodium coated silicon single crystal (Flat shaped, 1000 mm (L) x 100 mm (W) x 70 mm (T) ) with 3.5 mrad glancing angle. Focusing Mirror: 27.0 m Rhodium coated silicon single crystal (Troidal,1000 mm (L) x 100 mm (W) x 60 mm (T) ) with 3.5 mrad glancing angle.